At UN, Council Excludes Spokesman's Office Without A Fight, Ineptitude or Nationality? UNITED NATIONS, April 15, updated -- A shift of power has taken place in the UN, with UN Secretariat staff now barred from Security Council consultations, and it is unclear what role ineptitude has in the power play. Until now, when the 15 members of the UN Security Council met behind closed doors, representatives of the Secretary General's Office of the Spokesman, and UN Peacekeeping staffers, could attend. Beginning earlier this month, the UN Spokesperson's Office and most Peacekeeping staffers have been barred from consultations. Several of these staffers have complained to Inner City Press, how can they implement or explain the Council's mandates if they cannot hear what members think? But for Ban Ki-moon's Spokesperson's Office to be barred raises other issues, several journalists say. Already, they say, new Spokesperson Martin Nesirky finds it difficult to answer questions, even if he wants to, due to lack of sources. They marvel that Nesirky did not himself fight for access to consultations, but instead sent his Deputy Marie Okabe. Whether this was because Nesirky was away on travel through Central Asia, or because Ms. Okabe is Japanese like this month's Council president Yukio Takasu is not known. But the reporters slammed Nesirky for allowing his Office to lose power without even putting up a fight. "Fred Eckhart would never have allowed this," one said, referring to Kofi Annan's long time spokesman. "Even Stephane Dujarric," chimed in another, referring to the spokesman for the latter stage Kofi, now with UNDP. In most mature political systems, separation of powers questions are not resolved in such ad hoc, incompetent ways. But perhaps the UN is not a mature political system. Footnotes: Council president Yukio Takasu on April 15 was asked if there was any progress on restoring to the UN press corps at least as much access as they had on the second floor, before the Council moved to the UN's basement. Takasu called it a work in progress. Later, a UN Security official told Inner City Press, you have good news. Did it refer to access to the stairs, to be able to discourse with willing Ambassadors as they leave the Council? We'll see. Update of April 16: while access has still not been granted to the stairs, the pen to which the press is confined has been made smaller. There are moves afoot to install a UN TV camera trained on the Council entrance. "There'll be five years of this," one Ambassador quipped to Inner City Press as he left the Council. While the Office of the Spokesperson for the Secretary General was losing access to information with out a fight, its Associate Spokesperson Farhan Haq was doling out response to questions asked at the UN's noon briefing to media other than the one that asked. Such selective propaganda is another low point for the Office, perhaps not unrelated to its increasing loss of access, relevance and credibility. Update of April 16: At Friday's noon briefing, Inner City Press asked Martin Nesirky if the work of his Office suffered due to exclusion from Council consultations. He responded that he is still trying to understand the changes. We will revisit this issue. UNITED NATIONS, April 5, updated -- Following complaints Monday by at least two UN Security Council members about "involuntary interaction" with the media and non-Council member states, incoming Council president Yukio Takasu of Japan faced a series of questions about restrictions on press access. Inner City Press asked Takasu to confirm that in the morning's consultations, two Permanent members had said non-Council member states should wait out by the staircase, and the press be confined behind the staircase. Video here, from Minute 18:06. Ambassador Takasu, who had earlier spoken about the need for transparency, did not answer about the meeting, but said access should be "equivalent" at before the Council moved to the UN basement from its longtime home on the second floor. But Ambassador Takasu, tellingly, also spoke of Council members' desire to leave the consultation room "without being seen." Is this transparency or invisibility, one wag questioned. Inner City Press, which reported exclusively Monday morning on the Council's closed door meeting and move to push the press further away, has since learned that the concerned raised in the meeting including a move to bar representatives of the Office of the Spokesperson for the Secretary General from the consultations room. Beyond press freedom and access, then, this is a question of separation of powers. Inner City Press at Monday's noon briefing asked Secretary General Ban Ki-moon's Deputy Spokesperson Marie Okabe who controls UN Security and the building: the Secretariat or the Security Council? Video here. Member states, Ms. Okabe answered. But, Inner City Press followed up, does this mean merely the 15 states on the Council, just the Permanent Five members, or the full UN membership of 192? Ms. Okabe declined to answer, saying that meetings were being set up. But from the first of these meetings, the UN correspondents were banned. And a request to meet with the Japanese Mission, since they hold this month's Council presidency, was rejected by the Secretariat's Security Council Affairs unit, which said both that the complaints came from among Permanent members, and that these members are the ones to decide, since they remain on the Council. Several correspondents speculated that the move to restrict access came, perhaps surprisingly, from the U.S. Mission. Ambassador Susan Rice is known to have been incensed at the leak last year -- again, to Inner City Press -- of a draft resolution to impose sanctions on North Korea. 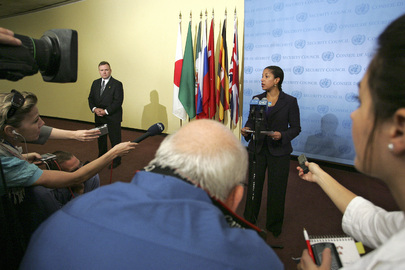 Correspondents note that unlike other P-5 Ambassadors, Susan Rice keeps a number of body guards between herself and the press corps. But the US Mission to the UN told Inner City Press that the US did not speak on the issue when it was raised in consultations by another delegations. Some now ask: why not? 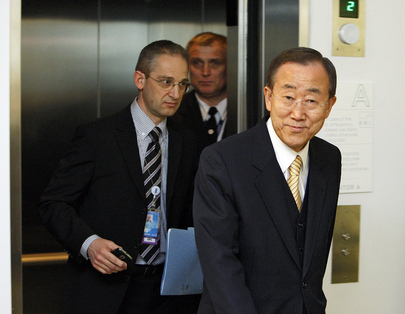 Old UN stakeout, with bodyguard - not to be seen again? France's Gerard Araud is at times acerbic toward the press. The UK's Mark Lyall Grant is businesslike, conducting recent stakeouts on Myanmar -- which he called Burma -- and Sri Lanka. Russia's Vitaly Churkin often jokes, how ever gruffly, with the press, and Chinese's recently arrived Ambassador Li Baodong has already held a free wheeling stakeout. These could all be public faces for closed door push-back at the press. One reporter surmised that the complaint may have been triggered by questions -- or rather, "good mornings" -- directed Monday morning to Ambassadors Li and Araud. We will crack this case. Watch this site. Our take: whichever of the Permanent Five is trying to push non-Council membes and the press away, they should step forward, and not use mid-level UN Secretariat staff as their mouthpiece. If the U.S. Mission, as the U.S. Constitution, is committed to freedom of the press and access to public servants, the U.S. should become the most vocal in ensuring continued press access, especially when restrictions on the press are raised by another Permanent Five member in closed consultations. The UK and France also speak about press freedom. And where is Ban Ki-moon and his team on all this? Update of 4:20 p.m. -- Ban Ki-moon's chief of staff Vijay Nambiar is said to have inquired what the Press' next move will be. While there's talk of a "sit in at the stakeout," watch this site. UNITED NATIONS, April 3 -- As the UN's Ban Ki-moon traipses Central Asia, what of political prisoners, UN hiring scandals and simmering cross border conflicts? Apparently for the UN Secretary General, these don't exist. Before Ban started his trip, Inner City Press asked why the UN was not even to solve the dam-based conflict between Tajkistan and Uzbekisan. Don't call it a conflict, Ban's spokesman Martin Nesirky said. What what should it be called? As Inner City Press has reported, Uzbekistan opposes the Tajik dam so much it shut the country's border. Why isn't the vaunted Regional Center for Preventive Diplomacy for Central Asia involved? On the website of the Center, there is not a single word about the Dam. but there is a tender announcement for the fitness equipment for the gymnasium at the UNRCCA building - the former elite Demiryolchy Hotel. The question is whether the procurement of the fitness equipment is reconciled with the UN budget rules and regulations, or whether it is a good UN background for the unsolved Dam conflict. http://unrcca.unmissions.org/portals/unrcca/gym.pdf is set of pictures. The curiosity is that it can be read only if the reader would pay 25 Euro (€) in advance (from each the price of Jenca’s article would be taken). Click here. the UN staff in general and of Jenca’s status in particular are not supposed to publish the UN related staff for money (not saying about other connotations). Turkmenistan would be the first country in the SG tour – 2 April (would SRSG Jenca inform the SG of the fitness equipment tendered – especially of the ball to play at the beach? I've been referred to you for a response to the allegations below concerning hiring in the Regional Center in Turkmenistan (the United Nations Regional Center for Preventive Diplomacy for Central Asia).Also, please tell me when Jan Egeland's job with DPA ended, what he did during his tenure and how much he was paid. In December 2007 the UNRCCA ( United Nations Regional Center for Preventive Diplomacy for Central Asia) was inaugurated by Lynn Pascoe, DPA in Ashgabat. Question: How could it be that Polina Pomogalova without a single day of the UN experience was shortlisted for an interview by PMSS while other candidates with the extensive UN experience in Central Asia and technically cleared to the positions of this category were not included? How could it be that the UNRCCA interview board recommended exactly Polina Pomogalova? The answer seems clear: she was the protégé of SRSG Jenca and it was he who had arranged everything. Again, there is more to this story, but let's start on deadline with what is the UN's / DPA's . the Center's response? The majority of the above was simply never responded to, just as the UN's Department of Political Affairs refused to respond to or address nepotism and hiring scandals in its Africa II unit and the Central African Republic. This lack of accountability extends to the UN's approach to human rights.